Samsung Galaxy Note 2 launching on T-Mobile October 24 | Android Blast! All four major US cell carriers will get the Samsung Galaxy Note 2, but T-Mobile is the only carrier with a firm launch date so far. 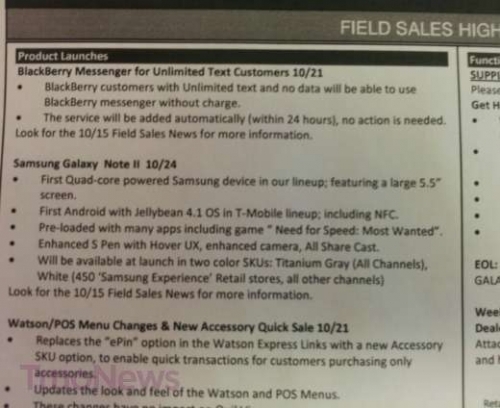 An leaked internal document that TmoNews has posted reveals October 24 as the launch date for the Galaxy Note II. As you already know, the new Note comes with 5.5-inch display, Android 4.1 Jelly Bean, a S Pen stylus, and NFC. The screen is larger than the original Note, but is taller so the phone fits better in the hand. The Note 2 will launch in two colors, white and titanium gray.